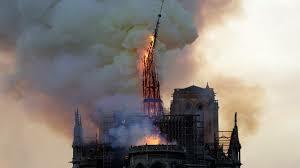 French President Emmanuel Macron has vowed to rebuild Notre Dame with help from the international community after a devastating fire gutted the famous cathedral on Monday night. Speaking just hours after the roof of the 850-year-old building caved in, Macron told the world's assembled press that a national fundraising campaign to restore Notre Dame would be launched Tuesday, and he called on the world's 'greatest talents' to help. Late on Monday evening fire chiefs confirmed that the structure of the cathedral has been saved, despite initial fears it may be entirely destroyed.